Tonight we’ve seen what I can only describe as the first genuine feeling of regret Emily Thorne has ever had about taking down someone from her list. It was only a matter of time before someone she targeted was either entirely innocent, or did everything they could to atone for their sins. Tonight it was Father Paul, a former employee of Grayson Global who joined the church after Emily’s father died in jail. Yet inspite of Nolan’s repeated attempts to get Emily to think it over, she went ahead and carried out the plan anyway. 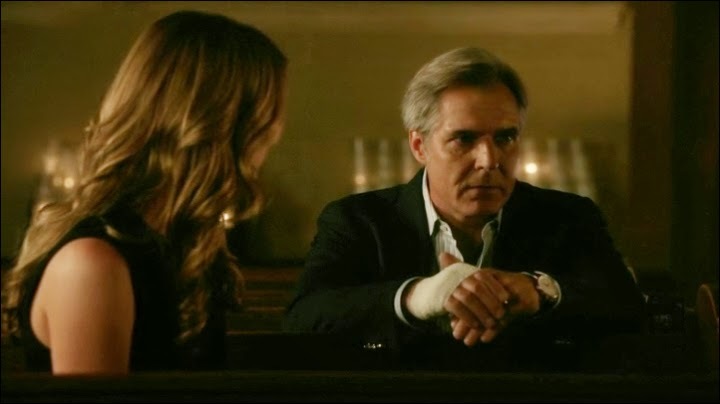 Ems, why do you want Nolan so close if you’re not going to listen to the man’s advice, which included him relaying your own father’s plea for you to learn to forgive? Speaking of Nolan, I’m hoping we get more of a relationship for him than the random men (and I assume we’ll see women as well as Nolan is bisexual) we’ll see taking the walk of shame from his place in the morning. So that’s on my wishlist for this season, but he’s understandably still hurting from Padma’s death. Now back to Emily who eventually finds herself moved to a place of forgiveness for Father Paul, but only when it’s too late to stop her plan. She vows to make it right however, if only because a conversation with Conrad revealed that Father Paul may be the only one who could actually convince Conrad to confess for his crimes. It probably won’t take much considering Emily IS in fact drugging him still. But come on honey, who’s going to be the first to put it together that every time you give him a drink or food he has an episode a few minutes later? Hopefully, the Grayson family drama will just conveniently pop up at the right moments and no one will bat an eye about her insistence on pouring his drinks. Of course the drama for tonight had to do with Patrick, oh sweet and innocent Patrick...he received a real lesson in just what his precious mother could be capable of. Apparently, he didn’t even get any cash all those many years ago that Victoria sent Frank to deliver. Instead he got a series of threats that were enough to keep the teenaged boy away at the time. Everything is lining up in Patrick’s favor so I can’t help but wonder if there’s going to be some massive twist, or if Patrick is going to bite the big one in a major way this season. As we’ve seen previously from former all around good boy Jack Porter, it’s the good ones that always take on the most collateral damage. So for the sake of Justin Hartley on our tv screens weekly, let’s all hope that there’s a twist coming our way and we see that the apple didn’t fall far from Victoria’s tree. Let’s hope he’s more capable of handling himself in this dangerous world of secrets and lies than we may have thought. Now let’s talk about Aiden since I just can’t in my heart of hearts believe that he’s going so firmly against Emily (and Nolan) now. However, he’s starting to worry me. Perhaps he and Emily do have different agendas now, but I honestly can’t see how he would turn on her completely in the six month span since we last left them. If he is against her then we’d best get some flashback explanation, because it doesn’t make a damn bit of sense right now. If he wanted Emily done with then why drag it out with Victoria? Why not tell her everything instead of the bits he’s feeding to her, which include his implication that Emily stole the Grayson fortune. Even after Emily and Nolan tried to stop you last season buddy, it was you who got rid of the Grayson fortune. Is he pissed only now for taking the fall for that? Inspite of the fact that Aiden’s motives continue to confuse me, I called Margo’s last week. Well her eye on Daniel anyway, and of course Daniel wouldn’t have just jumped her the moment she dropped the dress. He’s a committed man now with eyes only for Emily… until she does something that may severely change it. He’s also single-handedly making it more difficult for Emily to operate by suggesting the magazine be based close to home so he can have time with family. It’ll be a bit harder for Emily to scheme or knock priests out with Daniel “bedroom eyes” Grayson lurking around every corner!